Micron today revealed details about how it will go to market with a revolutionary new memory that it developed with partner Intel and that sports up to 1,000 times the performance of NAND flash. In June, Micron development partner Intel let slip its plans for releasing several product lines based on the new 3D XPoint (cross point) memory, which it will sell under the name Optane and release alongside its Kaby Lake processor platform. The Micron QuantX logo that will accompany 3D XPoint memory products. Micron will market its 3D XPoint memory under the name QuantX, and its go-to-market plans are "completely separate" and distinct from Intel's, according to Jon Carter, Micron's vice president of storage solutions. The first generation of QuantX solid-state drives (SSDs) will be aimed squarely at data center applications beginning in the second quarter of 2017, Carter said. Before then, Intel will likely have its own Optane data center SSDs out. 3D Xpoint forms the basis of Intel's Optane products. Sometime down the road, QuantX may find its way into mobile computer applications, but that won't likely be for some time, Carter said. Currently, Micron is planning to see its first revenues from QuantX sales in the second half of 2017, with 2018 being a "bigger year," and 2019 being the "break-out" revenue year, Carter said. 3D Crosspoint will be about half the price of DRAM, but around four to five times more expensive than NAND flash, Carter said. So while it will replace DRAM for many applications, it's not likely to replace NAND flash -- at least for prosumer applications -- anytime soon. "The issue I have right now... is not about the ability for revenue. We've built the capacity for the first couple of years; it's all accounted for," Carter said. "I've been in situations with partners who buy a lot of DRAM who've said, 'Do you know how much DRAM I buy? You'd better get me some 3D XPoint.' "
"The demand is through the roof. There's not enough. We're trying to manage the capacity and the capital expense to build the capacity for years three, four and five," Carter said. "I've had a long line of all the major storage and server vendors out there... coming to me directly talking about how they can get access to 3D XPoint." 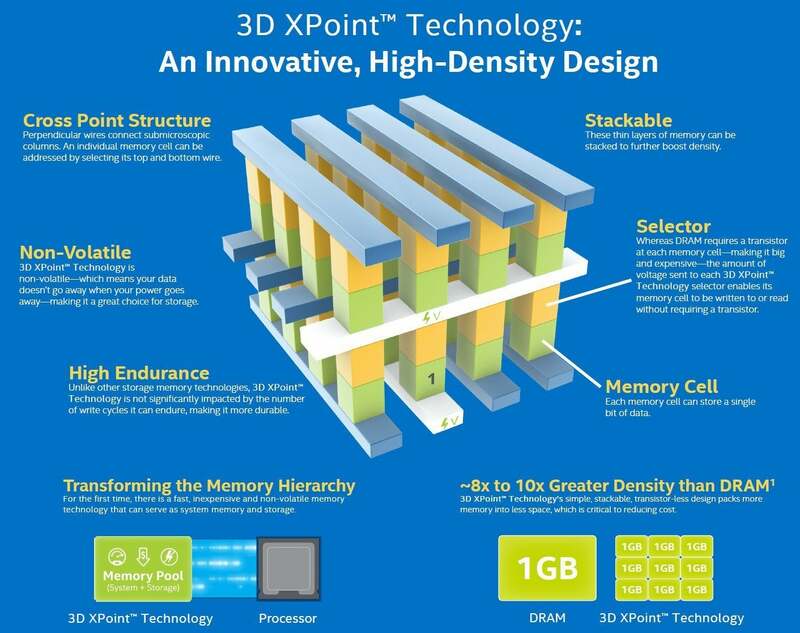 3D XPoint is primarily a mass storage-class memory that, while slower, is cheaper to produce than DRAM and vastly faster than NAND. So, the memory will likely fit into the data center as a replacement for some NAND flash and DRAM. Significantly, it's non-volatile, so when the power goes off, the data remains intact, just as it does with NAND flash. By the end of this year, Intel may also bring out Optane SSDs for the client market, though it's more likely that they'll ship in the first quarter of 2017, Carter said. In June, Taiwanese technology news site benchlife.info posted slides from a presentation showing that Intel's Optane line will be released by the end of this year. At its Intel Developers Forum in Shenzhen, China last month, the company said Optane has up to 10X the density of NAND flash and will allow SSDs to store more than a terabyte of data in an M.2 card that is only 1.5 millimeters thick. 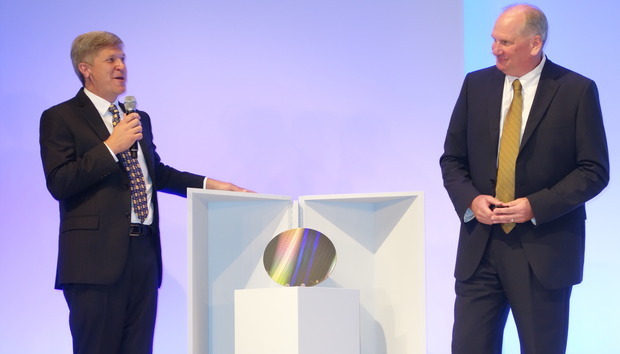 Intel senior vice president Rob Cooke shows off a 1.5mm thick M.2 card that he said will be able to hold more than a terabyte of data using Optane technology. Intel has said it will put 1TB, M.2 Optane drives into laptops and tablets, and up to 15TB of storage on a larger 2.5-inch drive. The SSDs will be compatible with the NVMe protocol and fit into PCI-Express slots. They should work with Windows PCs and Macs that have PCIe-compatible storage. 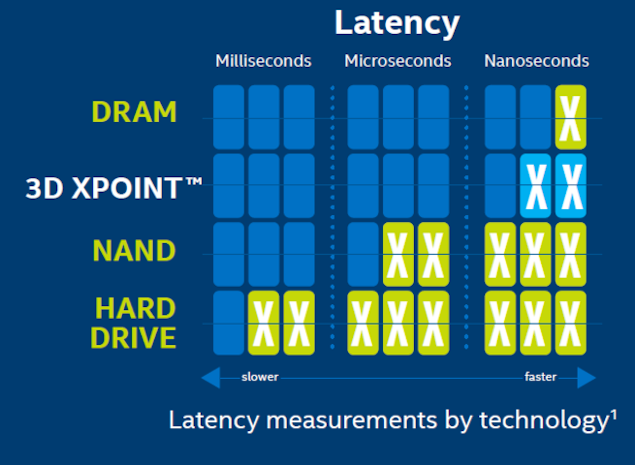 Micron, however, does not believe 3D XPoint belongs in the client computer space because its low latency, non-volatility and enormously long endurance is not needed in consumer systems. Most importantly, it's just too expensive to produce for that market. While some may argue there's a "little bit of a market" for the high-performance memory for the gaming and high-end camera market, in general "consumers are just not going to pay" four to five times the NAND price, Carter said. "There's no value proposition. In general, there's just no money there." 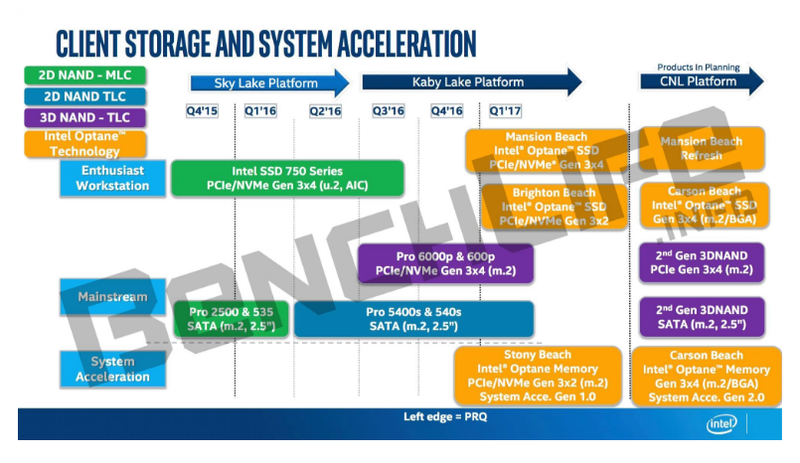 Intel let slip a slide showing the timeline for its upcoming Optane (3D XPoint) line of non-volatile memory products. Micron plans on partnering with "several" as-yet-unannounced manufacturing partners to release SSDs that will be able to replace both NAND flash and DRAM depending on the applications. Micron has already been shipping test models to those partners. One partner in particular is a major drive maker that will re-brand Micron's 3D XPoint technology under its own name. Micron's also partnering with "several" top-tier storage array makers that represent about 75% of a $5 billion "external, controller-based" high-end storage market. Those products will likely begin shipping in the latter part of 2017, Carter said. "We're working with them to incorporate specific instances of the technology. For us, it's just pouring into their ecosystem. They have the market prowess. They have the customer footprint," Carter said. "That's something Intel's not doing." "You'll see a series of announcements over the next six months," he continued. "You'll see some name-brand, very broad-coverage market players that are taking 3D XPoint from Micron exclusively and implementing it into their infrastructure offering for their customers. We're really excited about that. It's the first time Micron's done something like this." While Intel and Micron heralded 3D XPoint as "the first new class of memory since 1989," referring to floating-gate NAND, most experts believe it is a resistive RAM (ReRAM) memory based on a 128Gbit chip. Other than claiming it will have 1,000 times the performance and endurance of NAND, neither Micron nor Intel have let slip many in-depth details about the new 3D XPoint memory. Carter also declined to shed much light on it, other than to say "it's a new category." "We've been pretty coy about the technology in general," Carter said. "But, it is a completely new thing from the ground up. I know that's getting a little boring to say in some regards, but next year's going to be huge, and it's going to be interesting. The wafers we see coming through now are maturing quickly." With up to 1,000 times the endurance of flash, 3D XPoint SSDS would sustain about one million erase-write cycles; with that kind of endurance, the new memory would essentially last forever. Natively, NAND flash can sustain from 3,000 to 10,000 erase-write cycles. One decision Carter said may have been a mistake from a marketing perspective was announcing 3D XPoint technology so early in the development cycle. The companies made the first announcement in July 2015. "It made it look like it's late to market," Carter said. "It's not at all. This has been 10 years in making... and we now see the finish line." Carter admitted his company is not alone in bringing a new non-volatile flash replacement to market, but he believes Micron and Intel are about two to three years ahead of competitors. By then, Carter said, Intel and Micron will have 20% to 30% of the marketplace with the QuantX and Optane memory products. "We are aware [Samsung has] been working on phase-change memory in the background, but what interface they'll use is the only question now," Carter said. "Either way, we plan on having a leg up on them." Carter believes the demand in the server and storage market will far outstrip the supply for some time.